This article is about College of California. For New College of California, see New College of California. The College of California was the predecessor of the University of California public university system. In 1853, in the recently established town of Oakland, California, noted educators Rev. Henry Durant and Dr. Samuel H. Willey founded the Contra Costa Academy to provide boys with a liberal arts education with a strong emphasis on the classics. It was nominally nonsectarian with a general Christian atmosphere, although its trustees, educators, and supporters consisted of a coalition of Congregationalists and Presbyterians. This private college preparatory school grew quickly and by 1855, with the benefit of some government grants and a new charter, the newly renamed College of California opened in what by then had become the city of Oakland, on the four blocks bounded by Twelfth, Fourteenth, Franklin and Harrison Streets. Despite the new name, it did not add college-level courses until 1860. Within a few years, the downtown Oakland site had become unsuitable, owing to a lack of room for expansion, and the crowdedness and general rowdiness of the area. In 1866, the College trustees sought out a quieter, more rural site for their College. They planned to finance this expansion by selling land near the prospective college site. To this end, they formed the "College Homestead Association" and purchased 160 acres (65 hectares) of land north of Oakland on a site that is part of the City of Berkeley today. The College hired landscape architecture firm Olmsted, Vaux & Co. for recommendations on the site. Olmsted produced a 25-page survey and plan, dated June 29, 1866. Olmsted's work is now regarded as part of the legacy of UC Berkeley's planning, even though it was largely discarded. Sales of lots were less than had been hoped for. Even worse, although the College's trustees and supporters strongly believed in the importance of a liberal arts education, there was not much local interest in pursuing one at the college level. Meanwhile, the State of California had established an Agricultural, Mining, and Mechanical Arts College in 1866, but it existed only on paper as a placeholder to secure federal land-grant funds. In 1867, Governor Frederick Low suggested a merger of the already-functional and land-rich but cash-poor College of California with the state college, which had money but nothing else. On October 9, 1867, the College's trustees reluctantly agreed to the merger, on the condition that the new institution would be a complete university with a liberal arts college (the College of Letters, now the College of Letters and Science). They were aware the new state institution would have to be entirely secular, but recognized it was more important to find some way to preserve the College of California's liberal arts educational mission as part of the new university. The University of California was chartered with the enactment of the Organic Act on March 23, 1868, although it continued to use the College of California's Oakland facilities while the campus at Berkeley was being built. In September 1873, the University moved, with great ceremony, to Berkeley. 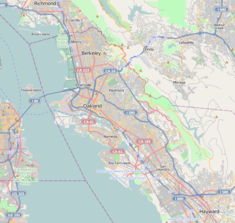 The site of the College of California in Oakland has been designated[when?] California Historical Landmark #45. ^ a b c d e "Site of College of California". Office of Historic Preservation, California State Parks. Retrieved 2012-03-30. ^ a b c d e f g Marsden, George M. (1994). The Soul of the American University: From Protestant Establishment to Established Nonbelief. New York: Oxford University Press. pp. 134–40. ISBN 9780195106503. ^ Olmsted, Frederick Law (29 June 1866). Report Upon a Projected Improvement of the Estate of the College of California, at Berkeley, Near Oakland. Towne and Bacon. Retrieved 8 October 2018. ^ "University of California Berkeley". Cultural Landscape Foundation. Retrieved 8 October 2018. This page was last edited on 8 October 2018, at 19:12 (UTC).